"Spring is better!" "No, fall is better!" "No, spring is better!" "Fall is better!" What you are reading is the debate between two gardeners about when to plants trees. Here's the secret, they're both right and a little wrong, at least here in Illinois. After a long, cold, and snow-laden winter, many of us gardener's are eyeing a particular spot. A spot that could use a tree. Fortunately for us gardeners, springtime heralds the newest stock of trees from nursery suppliers. Most trees sold during the growing season are dug from the field while they are still dormant in the winter and then shipped to garden centers across the region. Even local nursery growers tend to harvest dormant trees from the field and then stage them in their holding areas where customers can select their ideal specimen. 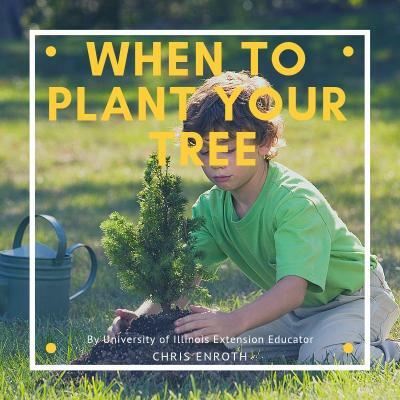 You will find all manner of tree planting advice, but the debate of timing of planting is especially contested and can be confusing for most of us. Essentially, the ideal time of year to plant a tree is when we receive regular rainfall. Based on that both spring and fall in the Midwest are good times to plant because these are times of the year when we tend to get more regular rainfall. There are also some species that do better when planted in spring. On the flipside, some species are well-suited to fall planting. According to the Morton Arboretum, trees that are slow to establish should be planted in the spring. These include bald cypress, American hornbeam, ginkgo, magnolias, hemlock, sweetgum, tuliptree, and willows. Trees that can be planted in the fall include alder, Buckeye, catalpa, crabapple, hackberry, honey locust, Kentucky coffee tree, linden, maple, sycamore, pines, and spruces. Regardless of when you plant, the survival of the tree depends on its care for those first two to three years in your yard. The first watering after planting should be a deep soaking. It is also critical newly planted trees are well-watered going into their first summer or winter. Continue to provide supplemental watering at least once a week after planting. If Mother Nature yields one-inch of precipitation, then you can skip watering for that week. You will need to keep an eye on the water for up to three years, which is the time it can take for a tree to become fully established. Mulch helps to insulate the root system and protect it from both winter and summer weather extremes. Use some type of organic-based mulch that will breakdown and add organic matter to the soil. Mulch two to four inches deep. Make the mulch ring as wide as possible. Avoid mounding mulch against the trunk. Mulch should never touch a tree! Spring and fall planted trees should have their trunks wrapped in the fall to protect from deer rubbing and winter damage. A loose paper-based wrap works best. Remove wrapping as it begins to warm the following spring. In my area, we have to discourage nibbling deer. This requires complete physical exclusion. Our newly planted trees are in little tree jails. It is for their own protection! One thing to keep in mind is if you do plant in the fall, it is likely that the tree has sat in the staging area all summer long and may be quite stressed. A benefit to fall planted trees is they tend to be on sale. I will admit to buying several trees on sale for fall planting. I learned the hard way; they were dead before I even put them in the ground. This makes buying from a knowledgeable garden center all that more important!